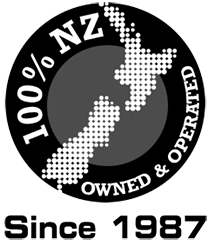 CSL are proud to be 100% NZ owned and operated and are equally proud to support locally owned businesses. That said, all local transport solutions are provided by Kiwi owned transport companies with whom we have built long standing business relationships with. For our customers, this means you receive first class service, competitive transport rates and peace of mind that your container will be trucked by some of the best in the industry. Swing lifts can either drive up or reverse into a driveway. They can only swing containers off of the driver’s side (right hand side) of the truck. These have very limited movements and flexibility, but are usually significantly cheaper than a Hiab.